just too dark. My paint store will mix the paint at 25%, 50%, 75% strength. Love the wall color tone it is soft and subtle — it is hard getting to the right shade painting small swatches on dry wall and hanging or placing it around the room, for color changes with the changing of the sunlight and dusk and night time. I had a friend that her living room was surrounded on all sides by windows facing in the 4 directions , it took her 30 times before she got the tone and color she wanted. She was patience and it payed off. Yours looks lovely already. Hi Joanny. Your poor friend! I think my laziness would just give up way before then! Trish, looks like your first try might just be the winner. the spot you’ve tried looks lovely….. Thank APG…it is SO soothing…it might sidetrack me from a darker, more daring gray! Thanks Marsha. I’ve got some gorgeous jewel tone bedding and pillow fabrics I’d love to be able to throw into the mix when I tire of the grays. 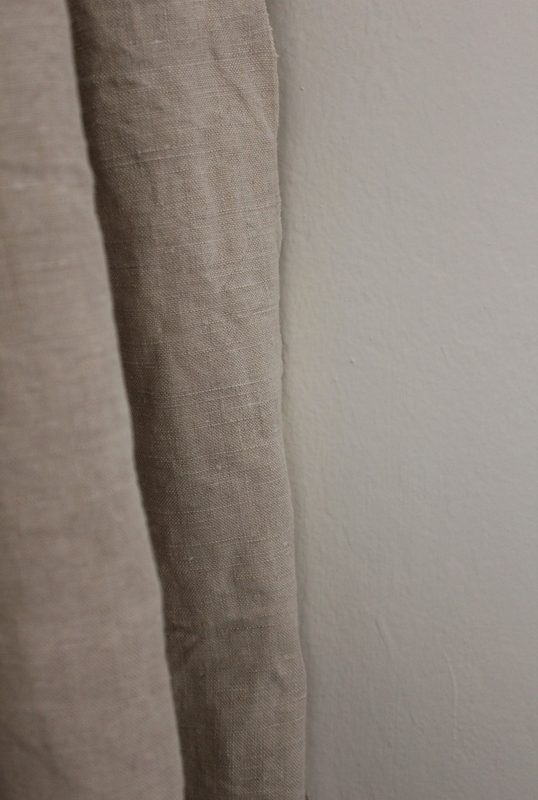 Even the curtains (antique French linen sheets) are clipped on a simple double faced curtain and can be switched out when I want to switch to cerulean blue. Or citron! I would love it if the wall would adapt to many changing venues! STUNNING. The color: you have hit the absolutely perfect pitch. If pressed, I’d say the only offnote is the height and needless fanciness of the baseboard. Solution: remove it and replace with something absolutely plain, and at least 6″ tall or taller, depending on height of ceiling. Bravo. Gosh…my sister will love to hear that. She’s baseboard-less and we just talked today about her staying that way! And I could kick myself for not doing taller baseboard. Try Benjamin Moore, MANCHESTER TAN, used it for an entire house. Pretty amazing!!!! Been a designer for 37 years… trust me. Looks great…thanks for the tip. Click here to see it folks. Trish, have you tried painting color on top of color. At least three shades. Start with a darker,or lively gray mixed with a little lavender (ala John Saladino), then adjust with lighter grey and one more adjustment with a beige. Thin paint 6 to 1 and leave each layer showing through in places. Sounds like a lot of work? Not really, it goes fast and it is stunning in all light conditions. Hi Gina. Actually, I did that with the kitchen fireplace lime-wash paint. 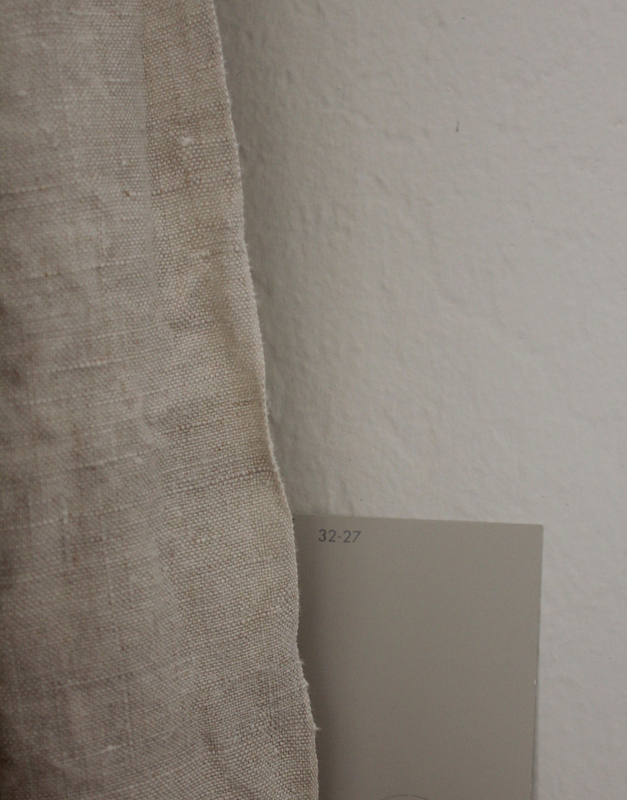 First color too light, second layer too blue/grey, third taupe. All together, the color was perfect. Didn’t think about trying with regular paint. The bedroom wall is very textured…so that would work very well. Thank you! Just beautiful Trish. I love your linens. Where oh where did you find them? Hi Delores. Curtains: lamaisonviolette.com…She’s in France now, but is at Booth D-15 at the Alameda Flea market. Bedding: Bella Notte linens outlet, info here. Absolutely Stunning, beautiful.. amazing! Love the color! I’m old enough to remember when there were only five colors with which to paint walls…white, beige, blue, yellow and pink. Wasn’t as creative but sure did save time! My husband, poor lad, can’t understand why I need three different whites to paint one room and a hallway. If you think finding the perfect gray is difficult, try finding the perfect white. I think Ben Moore has two dozen whites. Anyway, good luck, Trish. Can’t wait to see the final results. Good call on the paint mixing. Looks fab right now. Playing with lime paint is my favorite! If I was closer, I’d hop right over and help! or could you share where you found them. Hi Kathy. 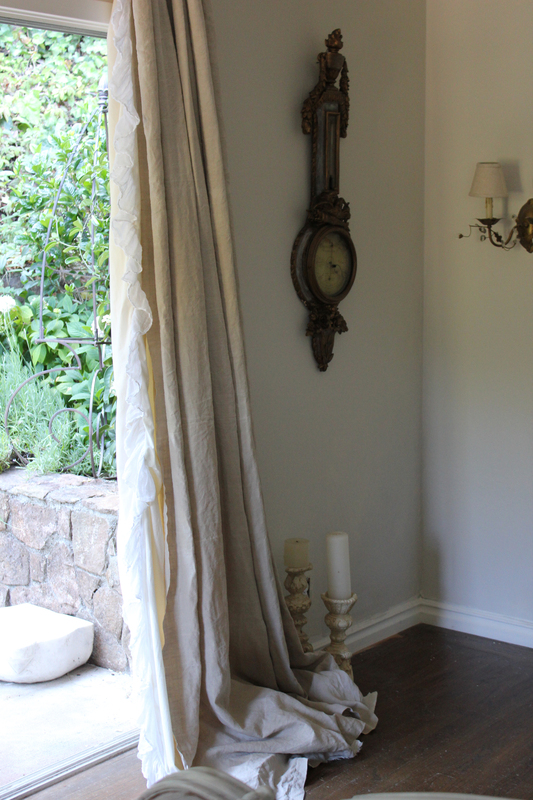 I actually had a set of silk curtains I wasn’t using anymore, and so took off the silk and added another layer of lining to encompass the inner lining, adding a ruffle from a damaged “Whisper” curtain panel that I picked up from the Bella Notte outlet in Novato (here). This panel is clipped along with the antique linen to several rings (Bed Bath and Beyond have tons of them)…so I can un-clip the linen and wash whenever I want to, and the panel buffers both heat and cold and sunlight. I like having the two layers of curtain…its worked out well. Hope that all makes sense! Trish, you are extremely generous with your design resourcefulness…! Thank you for the inspiration! Sometimes I feel I could play around with paint colour all day. The effect changes so much in different light, and against furnishing fabrics. I love what you have done, you seem to have so many precious and beautiful colours and textures in your home. I’m with you on the baseboard though, here mine are 9″. Oh so pretty…but I think you are going to like the Sydney Harbour lime wash the best. Since painting both of my fireplaces with it years ago, I have been tempted to paint the whole house in it and I would if I could pull it off myself. You know how high my ceilings are and I am just not willing to risk life and limb while painting from scaffolding. The lime wash is pure magic adding depth, movement and a timeless quality. And in your case it will so beautifully marry your interior to your gorgeous garden. I can’t wait to see the transformation!!!! By the way, I abandoned my Zinc quest…came up with another idea instead. I’d say I hope you have a relaxing weekend, but I’d rather you paint baby paint! So excited to see the result! warm thanks for the mention about the burnt umber. Your latest posts on greys have really helped me solve a tricky matter I’ve had for many years. adding the coarse linen fabric even improved it. It was the different structures my eye fell for. and not focusing on them separately. Now my so boring stairwell will have it’s French antique miroir, my problem was I couldn’t decide on the colour or material. Grey painted on wood with a natural old patina is now what I’m browsing the antiquemarket for. P.s. I love the Bella Notte linen. I’m loving the gray you just painted but it could go a little deeper so as not to fade out in the sunlight or at night. I’m still waiting to hear which gray you end up with without the undertones. Gray is such a hard color sometimes. Loving your barometer it’s stunning! Very excited about your project! Your post is so timely for me! I am redoing my master bath and had Sherwin Williams mix a sample of Pratt and Lambert’s Feathered Gray after seeing Joni’s kitchen. It reads very taupey beige to me as well–I guess the lighting really affects the appearance. I also have a sample of Benjamin Moore’s Revere Pewter which is a lovely color–just a little dark so I may try to get a sample at 75%. I redid another bath earlier in the year that is in much need of a custom shower curtain–I’ve been collecting samples, thinking beige linen may be too monochromatic but after seeing your curtain against the wall, I’m convinced that is the way to go. 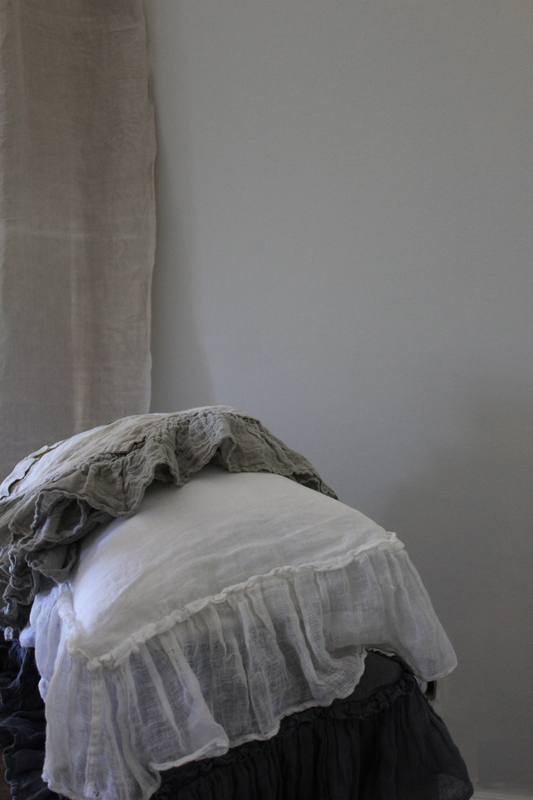 Trish, your old linen draperies are “formidable!” Is that a ruffled cotton sheer between the linen and the window? I have also enjoyed success with BM’s Manchester Tan in my foyer and hall: a cool neutral with punch. Best wishes. Our RH redo in Corte Madera is stunning…but too dark to be livable for me! 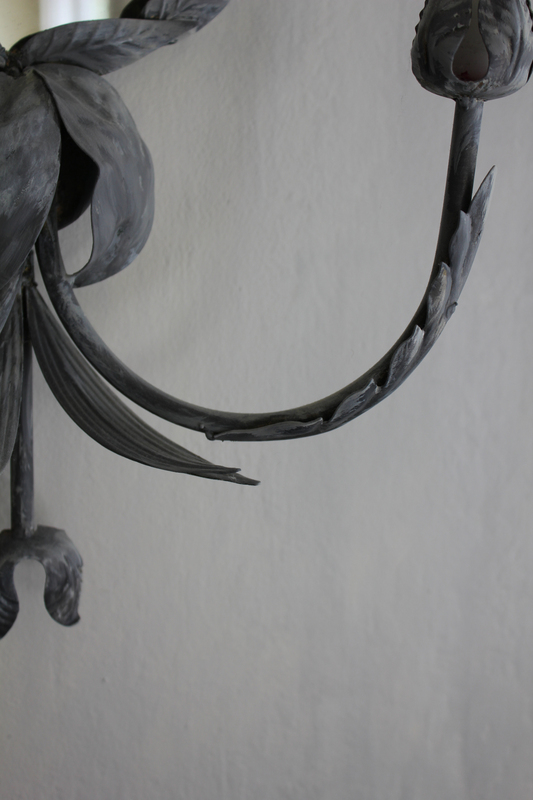 Getting a bit of grief from husband after his first look a limewash…but forging ahead on another wall! Love all the advice…Merci! Your gray looks gorgeous with your beautiful linens. I bookmarked a photo of gray paneling from one of your earlier posts that looked just like the perfect gray to me (Paper Illusions de Borchgrave Trouvais 2) with gilt and blue and white. It looks slightly warmer than yours and so luminous. You are always inspiring! Hi Jane. Thanks…good reminder! Paper Illusions photo here, post here. I do think that having saved pictures really helps to keep one focused on what we love! Sort of reaffirms the direction we want to go in. That trim color is so perfect, too. hmm. Thanks again! I just discovered that Marin Color Service in San Rafael carries Farrow and Ball. (You’re probably way ahead of me here.) F&B Shaded White looks very similar to me, but I haven’t tried a sample pot. I’m so in love with gray now. I find it comforting and my shoulders go down the minute i walk into a room that is grayed out. I’m consistently drawn to TROVE in Laguna Beach. Of course, I’m biased but the consensus is that it is inspiring and loved. Textures, colors, art, style, romance…..ahhhhhhhh! Oh! I truly love this color. It’s delicate and subtle. Two of my favorite requirements. 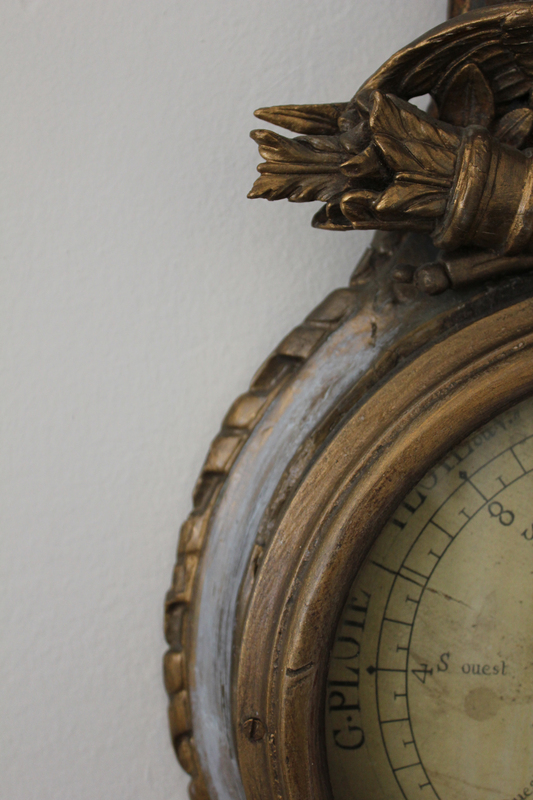 The color looks perfect and I love the antique barometer, gorgeous! You are having way too much fun! The next thing you will do is paint all four walls a different shade so they all read the same color with each light variance. Your headline for this story reminded me when my son was in grade school, he thought it was hilarious to post “dry paint” signs around the house! Looking forward to seeing the perfection you’ll be creating here. You always amaze me, HBD, How did you know I was thinking of doing that! 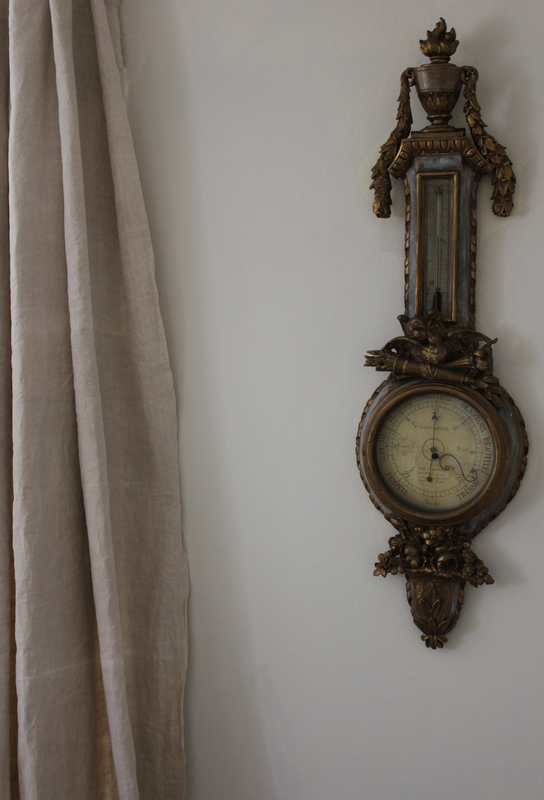 The walls adjacent to east facing windows are blanching a much lighter color than the dark corners on the barometer side of the room. Your son!!!! What a kick!!! Wonder who he gets that from? I do love your color mix….I also love a color called Aesthetic White…and even though it’s a Sherwin Williams paint I convert it to a Benjamin Moore Dulamel (eggshell or flat). It is a cameleon…gorgeous painted floor to ceiling…on woodwork and walls!!! what do you really think of feathered gray? not gray enough? let m eknow. Love this post. Wandered over to you blog from Cote de Provence. Glad I did! and so so perfect for your home! Your drapes are heavenly! I’d hang those in my bedroom in a heartbeat! They’d fit right in! You have so many lovely details in your home, and I love the way you share them. So tasteful. Personally, I love tone on tone. Many designers want a little more punch these days, but I love what you’ve got going on in your room. If you need punch or contrast, that’s what pillows are for! Wink! BTW, I’ve got Manchester Tan in a large room and hallway in my home right now. It’s fine, but not great. A little bit too boring of a color. I’ve never had anyone die over it and beg for the color…whereas they always ask about Wickham Gray (also BM). Not sure it would be as nice with your linen. But you know how paint is…can look fabulous one place and blah in another!